2 Ropewalk Cottages is 1080 sq ft. in size. It was built in 1860, and was originally one of a row of terraced cottages occupied by fisherman, rope makers and boat builders. It is superbly situated by Lymington's scenic waterfront and has its own parking space. The cottage is double glazed, gas central heated, well equipped and comfortably furnished. The bedrooms are downstairs and the kitchen and spacious living room with good sized balcony facing the sea and rivermouth, are upstairs. Downstairs: The master bedroom has a king sized bed and a large wardrobe with shelves and hanging space. A glazed door leads out into a private patio garden with garden furniture and attractive shrubs. The second bedroom has a single bed, chest of drawers, bedside chest and an array of robe hooks. The bathroom has a powerful shower over the bath and a back lit shaving mirror over the basin. The property benefits from a separate lavatory and basin. There is a glazed entrance porch which is invaluable for outdoor clothing. There is an external utility room in the front courtyard with Belfast sink, washing machine, tumble dryer, freezer, ironing equipment, bike stands and shelving. The parking bay is in a shared private drive with a short walk to the cottage gate. Upstairs: The living room is light and airy with wide French windows onto the balcony. There are 2 sofas and there is a large round table which seats five comfortably. There is a flat screen free view TV, a radio, a CD player, a DVD player and unlimited broadband internet/ Free WiFi. The modern and well fitted kitchen leads off the dining area and has an electric fan oven, electric grill, gas hob, microwave oven, generous sized fridge with ice box, dishwasher, toaster, kettle and a good selection of utensils and crockery. There is a pleasant view from the kitchen window of attractive houses beyond the drive. From the living room balcony you see dingy sailors tinkering with their boats in the adjacent carpark, masts in Lymington Yacht Haven, Lymington/Yarmouth ferries coming and going and the Isle of Wight. Close by are the slipway, the life boat station, the famous Victorian outdoor sea water baths, The Royal Lymington Yacht Club, the Town Sailing Club and stunning coastal walks through the salt marsh nature reserve: a bird lover's paradise. Lymington is a much loved Georgian town on the south coast with many good pubs and restaurants in the area. Lymington Town Station, the quay and the historic High Street with its bustling Saturday market are all only a short walk from the cottage. The New Forest National Park with wild ponies, cattle, donkeys, deer and gorgeous walks is a short drive away. The nearest beach is at Milford-on-Sea. Mudeford, Boscombe, Southbourne and Bournemouth beaches are just a bit further along the coast and well worth visiting. I have relations on both sides living in the area. One set of grandparents built a house in nearby Hordle over 80 years ago and later my other grandmother moved to Lymington too. We have lived here for 39 years and couldn't think of a lovelier place to be. We live in another cottage round the corner from 2 Ropewalk Cottages. We bought Ropewalk Cottage when our daughter at 31 decided to return home and retrain to become a teacher. We are retired and the thought of the alarm going off at 6.15 a.m and lesson plans covering the kitchen table was too much! We love the cottage and didn't want to sell it. Now we stay in it when our son and family come to lymington and they stay in our permanent home. Our stays are beneficial, we find little things we want to improve on all the time. Ropewalk Cottage benefits from an uplifting view of the Isle of Wight, the river, boats and sailors. We only get a glimpse of this, from our loft, sadly! We adore the area because of its beauty and all the outdoor activities it offers. The cottage is in a sought after road, set well back. It is near good pubs, shops, the quay and the market and only a short drive away from the New Forest and the beach. The living area is on the first floor and there is always something to watch from the balcony and the French windows. This makes it a special property. Parking is at a premium in Lymington, particularly near the water. This cottage has private off street parking for one. The public car park serves your visitors well if you cannot find free parking in the nearby roads. The cottage is tastefully and comfortably furnished and has interesting themed artwork. There is a local shop and good pub, The Mayflower Hotel, close by. A beautiful coastal walk runs in one direction from the cottage and the bandstand, slipway, town quay and town with its many boutiques, coffee shops and restaurants is an easy walk away in the other direction. The New Forest with its wild ponies, donkeys, cattle and deer is a close drive away as is Milford-on-Sea. Tumble dryer in utility room. You have sole use. Lovely well equipped kitchen: oven, extractor fan, dishwasher, large fridge, microwave, toaster, cooking utensils/crockery. View down onto attractive drive with lane at end and pretty residential road beyond. Seating for 2. The dining area is part of the open plan living area. There is a large round antique pine table which can seat 6 people, an overhead light and a big sash window. The drive from the parking space to the patio gate is gravelled. There are 2 thresholds, higher than normal and a 90 degree bend into the hall. The sitting room is up cottage style stairs that twist round. There is a hand rail up one side only. Children under 5, pets, smoking not permitted. 3 guests = 1 double room and 1 single room. Outside: Balcony. 2 pretty South East facing private patios with mature planting, garden furniture. Private off road parking for one on gravel drive. Free roadside parking close by. Utility Room with freezer, washing machine, tumble dryer, Belfast sink, wooden counter, clothes horse, clothes basket, broom, dustpan and brush, watering can, some picnic equipment. Included in price: Bed linen; Bath/hand/tea towels (please bring own swimming towels). The property is professionally cleaned between each let. It can be 'freshened up' in the middle of a 2 week let by request. Other: Attractive light and warm double glazed porch with seating and coat hooks, quarry tiled floor. The inner door leads to the carpeted passage with the bedrooms, bathroom, lavatory and stairs leading off it. Reach the top step and see the marina and Isle of Wight ahead of you through the living room French windows. 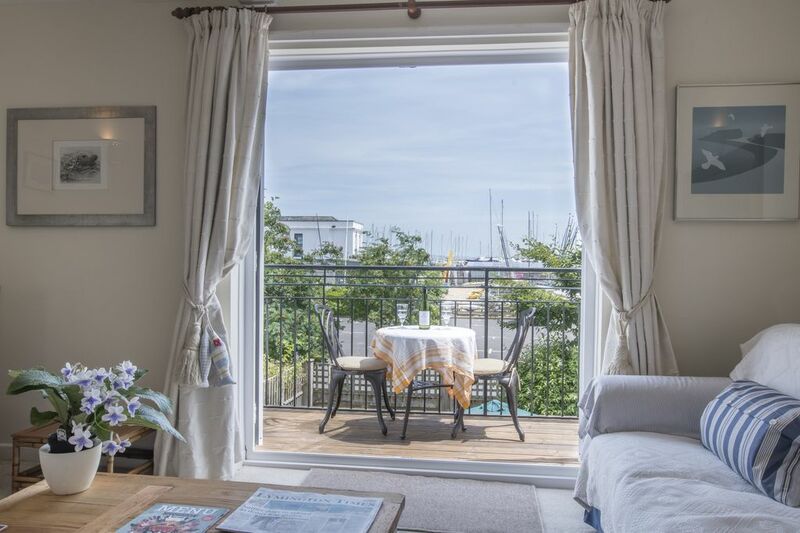 Ropewalk Cottage is ideally situated in Lymington for the town, harbour and nature reserve all within walking distance. In an attractive area, with its own parking space. a visit, as are the shops themselves. equipped with pleasant sitting out areas back and front. A charming cottage, in a lovely area- a perfect base for exploring. The cottage itself is spotless and so charming- we felt at home straight away. Caroline was so friendly and explained how everything worked. I was particularly impressed with how secure the cottage is. The high fence and lockable front gate meant I felt safe sleeping with the window open ( although I can’t imagine this area has a lot of crime!) We had a delicious Sunday lunch at the Mayflower, a popular “gastropub” which is just round the corner. Breakfast at the Yacht Haven at the end of the road was a treat- despite being a couple of scruffy cyclists we were still treated as if we were one of the huge yacht owning millionaires! One of the cycling routes goes from here all the way out to the spit at Hurst Castle, all along the shoreline, which was spectacular. All this, with the beauty of the New Forest, made for a perfect holiday! Many thanks for your review Clare. You have summed it all up in a very refreshing way. Security hadn’t been highlighted before and we are grateful for this comment: the cottage is ‘upside-down’ so that the view can be appreciated from the living area, hence bedrooms at ground level and the importance of security. Even if not on a bike, Hurst spit is so well worth going to for the beautiful sunsets. Thank you, too, for all the stars. Messages about cleanliness are always passed on to the cleaners to spur us all on to keep the standard up. We hope we might be able to welcome you again one day, that is to say if you haven’t covered every cycling route! A comfortable house, helpful owners nearby, everything we needed. Thank you very much for your review and all the stars. Thank you very much for your review and all the stars. I am very pleased you enjoyed your stay so much. Very nice stay, the Owners were gracious and went above and beyond to make our stay a pleasant one. The New Forest National Park. Hurst Castle and ferry (English Heritage). Lymington is in a much sought after area on the south coast offering sailing, fishing, golf, bird watching and cycling. There are wonderful walks from the cottage around the sea wall in the Lymington-Keyhaven nature reserve of outstanding natural beauty. Small boats are launched from the slipway by the cottage and larger ones and ferries can be seen going up and down the river, so the sights are ever-changing. The nearest beach is Milford on Sea which is a 10 minute drive away. Nearest shop 3 minutes away. Nearest pub 2 doors away, good food. Public car park behind the cottage, useful for your visitors.Town centre and trains and buses about a 10 minute walk away. The New Forest with all its wild ponies is 10 minutes by car. The nearest beach is Milford, 15 minutes by car. Southampton, Bournemouth, Portsmouth, Salisbury all within easy reach. Waitrose at top of town with free car park; Tesco with paying car park behind it; free parking for 1 hour in the High Street; M & S with free car park for 1 hour; many restaurants, pubs and coffee shops. Vibrant Saturday market. Very attractive old quay, river with lots to watch. Bandstand. Lovely forest walks and pubs. Several banks and building societies.